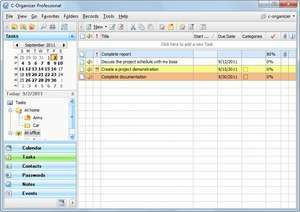 C-Organizer Pro is a stylish and powerful manager of your personal and business-related information. The program employs user-friendly interface to make working with this software simple and intuitive. C-Organizer Professional was created to help you plan your personal and professional life. This application contains Planner, Address Book, Password and Bookmark manager, Notepad, and Calendar of Events. C-Organizer Pro 7.0 is a shareware program and can be used as a demo to try the software until the free trial period has ended. A full version of the program is available after the trial period ends. For security reasons, you should also check out the C-Organizer Pro download at LO4D.com which includes virus and malware tests. Additional screenshots of this application download may be available, too. C-Organizer Pro has a presence on social networks.